A couple of months ago I saw the Sci Fi Channel's Dune and Children of Dune miniseries. I had heard about the Dune videogames before but basically the only thing I knew about the Dune universe before I saw the miniseries is that it involves deserts and giant worms. After watching the first part of the miniseries I became intrigued by the Dune universe and after watching Children of Dune I decided to check out the Dune novels as I noticed they were getting rave reviews at places like Amazon. The Dune universe is set in a distant future, there are currently about 15 novels in the series and they span thousands of years. Dune is the first novel in the series, this epic scifi masterpiece was published by Frank Herbert in 1965. Like I said, the story takes place in a distant future but it feels unlike most other scifi novels as humanity has undergone radical changes. The cultures in the Dune universe possess or can use very advanced technology like force fields, anti-gravity devices and interstellar travel but many things are totally different then you would expect from science fiction set far into the future. For instance, some technologies like thinking machines (computers and robots) have been banned due to terrible events and were replaced by "mentats" - humans trained to mimic computers. And also the Fremen, the mystic and hardened desert people of Arrakis. The main character of Dune is Paul Atreides, the son of Duke Leto Atreides and his Bene Gesserit concubine, Lady Jessica. 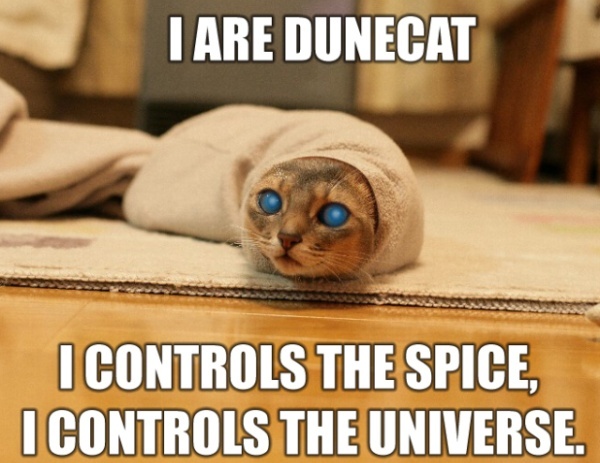 At the beginning of Dune, Duke Leto Atreides is put in charge of Arrakis (aka Dune), a barren, dry desert planet were the most valuable substance in the universe is harvested: the Spice. However, shortly after arriving on Arrakis a plot against House Atreides begins unfolding, the Atreides face treachery and the young Paul will need to find a way to survive on Arrakis. Paul discovers he has been gifted with the ability of prescience, he can see the different lines of the future unfold before him, and he will play a vital role in the future of not only Arrakis, but also the Imperium.. The Duke of Atreides has been manoeuvred by his arch-enemy, Baron Harkonnen, into administering the desert planet of Dune. Although it is almost completely without water, Dune is a planet of fabulous wealth, for it is the only source of a drug prized throughout the Galactic Empire. The Duke and his son, Paul, are expecting treachery, and it duly comes - but from a shockingly unexpected place. Then Paul succeeds his father, and he becomes a catalyst for the native people of Dune, whose knowledge of the ecology of the planet gives them vast power. They have been waiting for a leader like Paul Atreides, a leader who can harness that force ...DUNE: one of the most brilliantr science fiction novels ever written, as engrossing and heart-rending today as it was when it was first published half a century ago. Dune fan art courtesy of Adoc at deviantART. 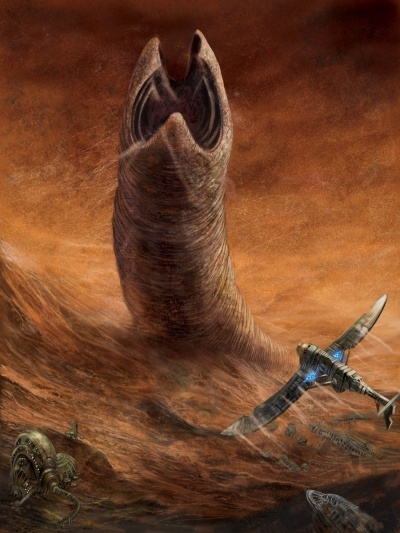 The picture shows Shai-Hulud, this is a Fremen name for the giant sandworms that are found on Dune. Dune isn't only a work of science fiction, it also features a complex interplay of politics, ecology, and religion. The story features many themes inspired by various cultures on Earth. Many of the new words introduced by Frank Herbert in Dune are of Middle Eastern origin and you can clearly recognize Arabic/Islamic themes in the story such as holy war (jihad) of the Fremen against the oppression of the Harkonnens and the Empire. There are many analogies with our world too, the shortage of water on Arrakis for example reminds you of oil scarcity but also of the water shortage in the Middle East. And as this work was written during the Cold War era it shouldn't surprise you that the evil Harkonnen Baron in Dune has a Slavic name: Vladimir. It's not a short book and at times it can be pretty complex, partly because of the dozens of new words the author introduces, but if you're a fan of scifi I highly recommend this novel. Dune has a very rich story and it's set in an intriguing universe that will leave you longing for more. I give Dune a rating of 9/10. You can buy Dune at Amazon. The next book I'm going to read is Darkly Dreaming Dexter, I like Dexter a lot and hope the books the Showtime TV show is based on are at least as good. Afterwards I plan to explore the Dune universe some more with Dune Messiah and Children of Dune.